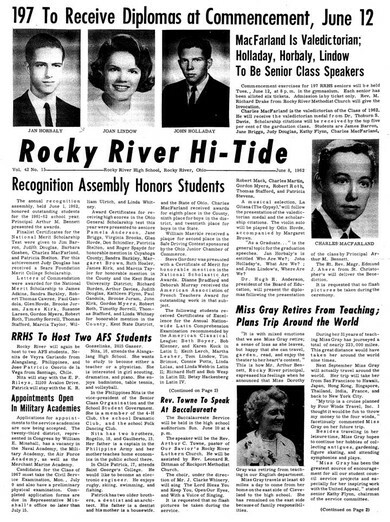 Welcome to the Rocky River High School Class Of 1962 web site! We had a fantastic reunion over the past two days. Sixty-two alumni attended. Over the next few weeks we'll be posting many stories and photos from the weekend. We'd like to encourage those who took photos to upload them to an online service such as www.shutterfly.com, www.flickr.com, www.picasaweb.google.com, or www.CVSphoto.com. Directions for creating an account and uploading images are on each site. There is no cost unless you select pictures to print. Once your pictures are uploaded the site will give you a "link" address used to view the pictures. Send us the link to your online album (use contact us). We'll post a list of all the links on our home page. That way everyone can see your photos. If you used a film camera, please ask the developer to create a DVD or CD with the initial development (it should't cost much.) Then either upload the photos or send us the DVD/CD's and we'll post them for you. Also, as Pete Gandola urged everyone, please reflect back on the past 50 years and blog your perspectives on the Memories Blog. Just click on "Post New Topic" and type away! Let's all keep in toch! 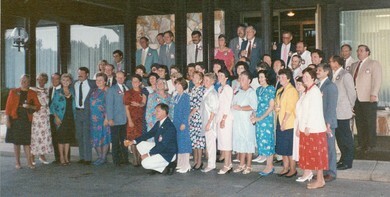 Pat Shelton Carbone found a photo from our 25th reunion! Click on the image to see a more detailed copy - then use CTRL+ repeatedly to enlarge further. Charles MacFarland found a some classic photos from our era. Take a look here! My most vivid memory of the All Night Party actually has to do with the morning after. Thank you Jackie Mueller for saving my life and that of a dozen or so of our classmates! Someone thought a real cruise on Lake Erie on Jackie's sailboat was a great idea so a bunch of us headed for the Yacht Club. I'm not sure what time it was, but my memory is it was pitch black and the moon was out as the sky was clear. The Lake was smooth as glass. All were having a great time--some more than others as even calm waters made a few queasy after a night of eating everything in sight. Then, as is wont to happen on the shallowest of the Great Lakes, a fairly violent thunderstorm came up when we were well away from shore and the Lake got incredibly choppy. Some of us were convinced we were going to capsize, or at least be tossed from the boat. Those who didn't think that just wanted to die before they got the dry heaves. Long story short--thanks to Jackie's skill as a yachtsman, we made it back to the Yacht Club dock where most of us kissed the ground and vowed never to go boating on Lake Erie again. I understand our Jackie went on to rival Commodore Perry in his exploits on the high seas. Hi Everybody, I remember the all-night party very well. I went with Helen McSweeney, who also went with me to the prom. We double dated with Pete Batterton and his date, if I remember correctly. We all went to a park beforehand and dranks some whiskey, so I think I may have been a bit tiddly at the party. I think someone gave me some sneezing powder or some such prank on a cookie or cake. I know I ate the cookie whole, which must have made the perpetrators nervous. I remember several people, who presumably were in on the joke, asking me anxiously if I felt all right. In fact I felt great, and made it through the whole night, something I didn't do for another thirty years, until rave parties started commencing at midnight in recent times. Looking back, things that seemed very daring in those days just seem quaint nowadays. But then, many things in 1962 were much better than now, so I look back on those days with fondness. If anybody remembers what was on that cookie, I'd love to know. 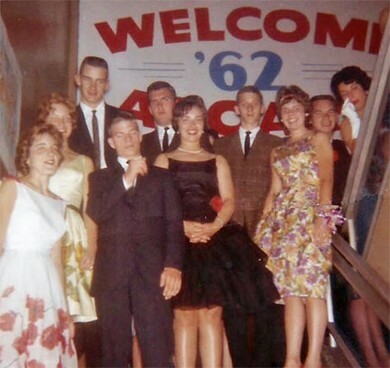 Remember 50 year ago tonight (June 12, 1962) when our parents put on the all night party? We were at city hall locked away so we couldn't get into too much trouble... The party was followed by breakfast on Wagar Beach! Email us any memories you have of the night that you want to share! View the invitation to the party and the program! Note the names our parents came up with for the skits in the show. Clearly the space era had begun. Click here! 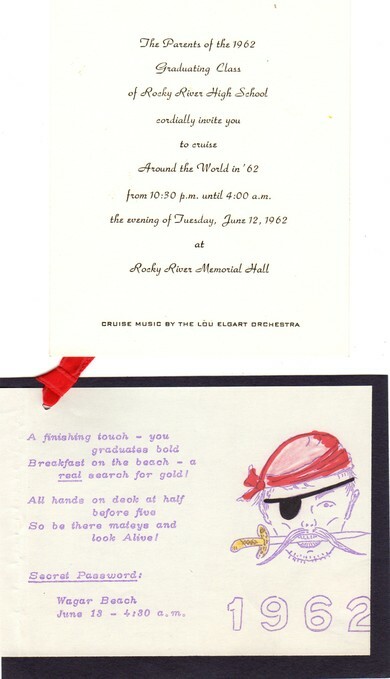 Commencement was held on June 12, 1962. Three classmates spoke on the general topic "As a Graduate..." - Jan Horbably on "Who Are We? ", John Holladay on "What are We?" and Joan Lindown on "Where are We". Jan found a copy of his speech (!!) which you can read here. It reads well even 50 years later. Nice job, Jan! Our commencement day Cleveland Plain Dealer is below. The world we lived in was very different from today - well, almost... Check out the political cartoon on the editorial page. All the sections are fun reads. And the TV guide had... 3 channels. How did we survive? Click to read the our entire Hi-Tide from graduation! Remember the signature booklet we each had at the Baccalaureate buffet? It was for getting everyone's signature since we didn't have our Yearbooks yet. Rick Pfizenmayer found his. See if you signed it! Click to see the entire booklet.